Original assessment of causation deflects blame away from dam builder. 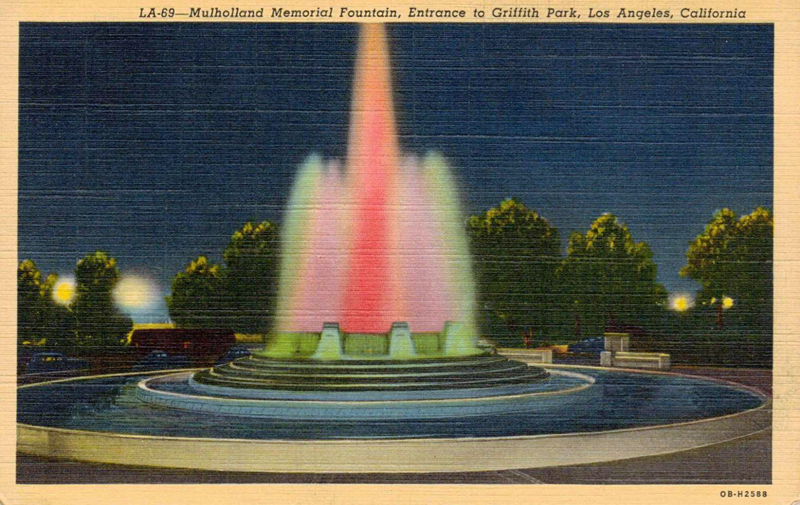 1940s postcard showing the William Mulholland Memorial Fountain at the entrance to Griffith Park. Click image for more. This article was written to coincide with the 82nd anniversary of the St. Francis Dam Disaster. When night blankets Los Angeles, an area near Riverside Drive and Los Feliz Boulevard comes alive with colored lights and cascading waters, a spectacular display courtesy of the William Mulholland Memorial Fountain. Set amid nearly four acres, the fountain is a fitting tribute to the man who corralled other peoples' water to quench the thirst of a growing Los Angeles. Of course, Mulholland's efforts also managed to bring even more cash to the wallets of a small group of rich and powerful men whose parched greed could never be doused. So revered was Mulholland, and he remains so, that more than 3,000 people attended the Aug. 1, 1940, dedication of the fountain. The Los Angeles Police Band played for the enthusiastic crowd; the city's Civic Chorus raised their voices in praise; important men whose very presence conveyed wealth made flowery speeches. The most important and wealthiest among them, Los Angeles Times Publisher Harry Chandler, was also on hand to pay tribute to the man who had been his personal — and his newspaper's — favorite Angeleno. Chandler had much to be thankful for, but left unsaid was the fact that he was a principal shareholder of the San Fernando Valley-owned syndicate whose dreams of development became a reality with the 1913 opening of Mulholland's 223-mile aqueduct. Nearly 90 feet in diameter, the fountain's colorfully lit waters reach 50 feet in the air. Nearby a bas-relief bust of Mulholland rests on a monument, his handsome brow still Irish-tough, his intelligence evident among the gentle ripples across his forehead. The Department of Water and Power, without special emphasis on the important latter word, also has a monument sign. It was March 30, 1940, when one of Mulholland's granddaughters — not the one who decades earlier had been the focus of a nasty custody battle gently covered in Chandler's Times — wielded a ceremonial shovel to signify the beginning of the project. In August another granddaughter (again not the one whose custody Mulholland ultimately obtained) pushed the button that activated the fountain's pump. The fountain was completed a little more than five years after the 79-year-old Mulholland died on July 22, 1935, from old age, disappointment and a broken heart. Unmentioned at either event was that just 12 years prior, another water holder, the Mulholland-designed and -constructed St. Francis Dam, had collapsed, destroying the Santa Clara River Valley, its waters crashing through narrow San Francisquito Canyon and ultimately killing as many as 1,000 people. Many of the dead probably hadn't known about the dam nestled in the canyon, started in secret in 1925 and completed and destroyed in record time. The dam collapsed March 12, 1928, a few minutes before midnight. With the nearby electrical power plant wiped out, there were no lights, so most could not see the water until it was upon them. For decades thereafter, Mulholland's reputation and legacy were closely guarded. 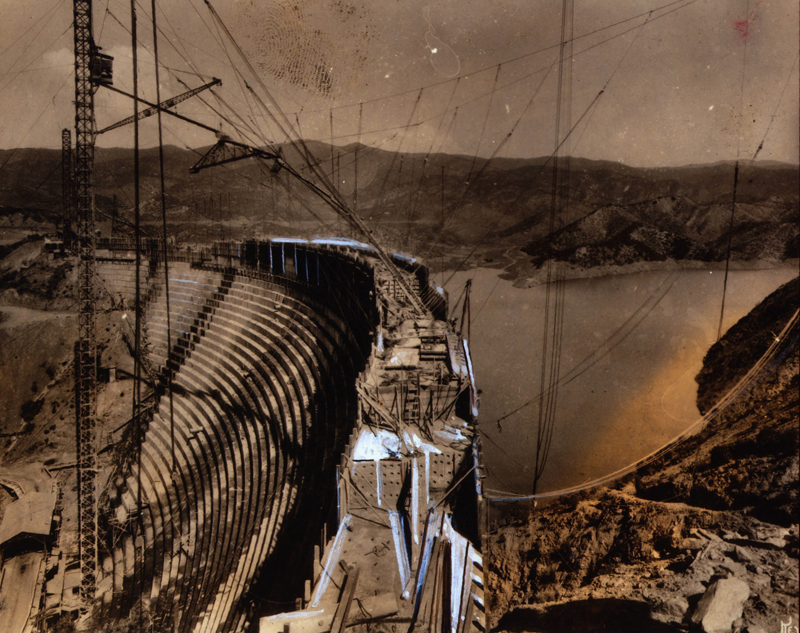 Almost all defended Mulholland, but Thomas M. McMullen, who tackled an independent study of the reasons for the dam's failure, believes the great man must shoulder much of the blame. McMullen feels somewhat sorry for Mulholland, an emotion that certainly would have infuriated the famous water bearer. 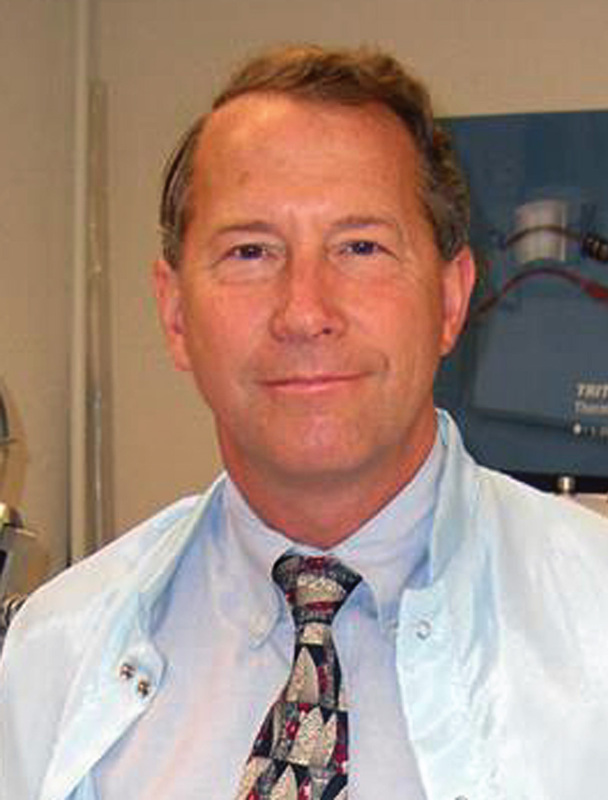 Now director of the University of Maryland's College of Computer, Math and Physical Science, McMullen's 2004 master's thesis was titled, "The St. Francis Dam Collapse and the impact on the construction of the Hoover Dam." Before he began his research into the construction of the Hoover Dam, McMullen, who was pursuing his master's degree in civil engineering, had never heard of the St. Francis Dam. By the time references to the disaster caught his interest and he investigated the cause, the focus of his thesis changed from construction to destruction. McMullen found he was "surprised at the number of things" that pointed away from the widely accepted "soft-shoulder" theory, which centered on the ancient slide upon which the dam was constructed. The theory had been in play for decades, shifting blame away from Mulholland and onto geological conditions that supposedly weren't recognizable at the time. Nagged by inexplicable construction issues, McMullen was surprised with the scant and shoddy official state report on the collapse. California Gov. C. C. Young had ordered the report compiled by engineers and geologists, and McMullen found that after their first meeting on March 19, seven days after the collapse, the commission completed the report in five days, before the disaster was even two weeks old. All that short while, Chandler's Times was running thundering editorials warning people not to rush to judgment, and noting that no matter how long it took, what happened to the St. Francis Dam must be investigated to the fullest extent. "To the fullest extent," at least in the case of the governor's report, was a scant 13 pages of engineering team-written material, two pages each of Young's letters, and rock and concrete tests, as well as 31 pictures and maps of visual filler. Not surprising to McMullen was the report's conclusion that the failure stemmed from defective foundations, and that there was nothing to indicate that the accepted theory of concrete gravity dam design was in error. Most important to McMullen, the report noted that water storage, so vital a California resource, must and would hereafter be subject to the police powers of the state — a conclusion which, McMullen said, "mirrored the tone" of Young's original instructions to the commission. McMullen's thesis noted many important details in the governor's report were not taken into consideration, or were glossed over, such as the "unimportant" leaks through the main structure and wing wall; a discrepancy in foundation depths; the lack of an entire dam drainage system to relieve uplift pressure; and the lack of grouting. The concrete itself, McMullen noted, was "immediately excluded from having played a part in the disaster." Geology of the dam site was of greatest concern to the commission, whose report focused largely on the canyon walls and streambed. The commission concluded that defective foundations were what brought down the St. Francis Dam. About 75 years would elapse before McMullen zeroed in on the inferior concrete and shoddy construction as "eventually caus(ing) in my opinion the failure." The dam under construction. The white marks are a newspaper editor's embellishments to the photograph. Click for more. If the concrete had been a "of a better quality," McMullen concluded, the dam "would not have fallen apart as it did. It was so filled with fractures" that the 175,000 cubic yards of concrete just broke apart under the pressure of the water that snaked through fissures and swirled around stream rocks of various sizes and shapes, delicately suspended in worrisome air pockets. The lack of proper curing and the quality of the pour work itself were a recipe for disaster, or rather for the "catastrophic failure" that McMullen termed a tragedy brewing for the Santa Clara River Valley. For his eight-month study, McMullen trekked to California, visited the site of the dam, pilfered some concrete samples and had them blind-tested, the results showing the sloppiness of the materials and preparation. The concrete experts "investigated on a microscopic level" and found gaping air pockets among the uneven aggregate taken from nearby streams by an army of shirtless men wielding shovels. Probably the quality of the concrete alone, even without being coupled with the lack of curing and grouting during the hurried construction process, made the disaster inevitable. McMullen believes Mulholland knew there were serious problems with his St. Francis by the time the dam waters rose to 60 feet below the crest and a major leak appeared. "The dam wasn't even filed when water was getting into this concrete, chemically breaking it down," McMullen said. But there was no turning back, and no spillways to empty the structure in a timely manner. Mulholland, who as child in Dublin, Ireland, is said to have been beaten by his father for receiving bad grades — an act that led him to run away to be a seaman — was an ambitious, self-educated man who rose from ditch digger to the most important figure in the state. Nobody told Mulholland what to do, especially when it came to building waterworks. It was even true with arbitrary changes. McMullen said the St. Francis "wasn't even built according to the design," with the toe substantially smaller than originally sketched. And then the dam face was raised twice during construction to accommodate another 8,000 acre-feet of water that was added to the original storage plan of 30,000 acre feet. When the dam burst, just days after it was declared filled for the first time, it held 12.5 billion gallons of water which, once released, traveled about 58 miles to the sea, consuming everything in its wake and leaving behind silt graveyards in some areas up to 70 feet deep. About 12 hours before his dam gave its final heave and collapsed into pieces, Mulholland visited the site, summoned by the worried damkeeper who noted a widening crack running water and mud. Dams, Mulholland said, always have cracks and leaks. The statement was generally true, but in this case, McMullen said, with the way the St. Francis Dam was constructed, "It just couldn't hold the weight of the water." McMullen believes Mulholland knew it. Next time: An interview with Thomas M. McMullen.